Age is not just a number. Just like your car, your technology and your appliances, your roof’s age plays a major role in its efficiency. The average shingle roof should only last about 15 to 30 years before it needs to be replaced so keep this in mind if you had yours installed a while back. 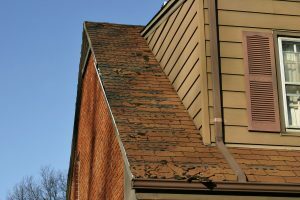 We highly recommend inspecting the shingles a few times a year. If you notice that any of them are buckling, curling or losing granules these are all signs that your roof could be getting up there in age. It’s also important to notice any shingles that are missing – the more that aren’t intact, the more likely it is that your roof needs to be replaced. Not only is it important to check the outside of the roof, it’s also vital to check it from the inside. Look for sagging, dark spots or moisture damage and if you find anything out of the ordinary, call in a professional for assistance. For a variety of roofing services, look to North East Home Improvement. With unmatched customer service, years of experience and professionalism, we provide the best option for any and all roofing needs. Call us today at (203) 321-6695 to learn more!